Last year we had the distinct pleasure collaborating with Fort Greene Park to install a 110ft long x 10ft wide pollinator garden in what was a neglected area alongside the park’s tennis courts. This was first garden of its kind in Fort Greene Park. 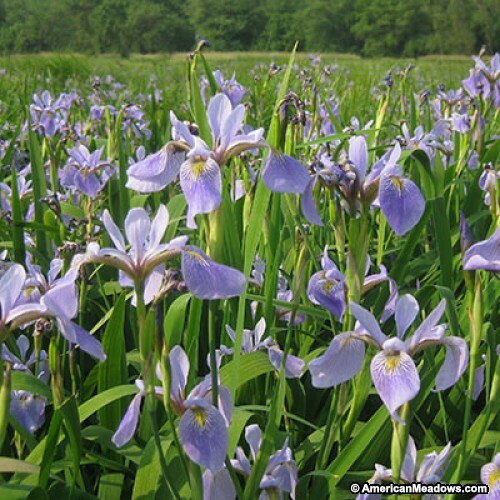 With over 800 individual native plants from 40 separate species. This incredibly diverse garden attracts scores of beneficial insects such a butterflies and honey bees as well as migratory birds and most importantly, people from all over, who come to enjoy its natural beauty and dynamic relationship with wildlife. Utilizing my studies in art, landscape design and native plants, I was able to consult the park on how to best execute this project with minimal capital and limited time. I used the resources and connections established through Native NY Gardens to source high quality plants from local nurseries, deliver them to the park and lead a group of volunteers and park staff to install the garden as a team. It was a massive done in a streamlined, fun and educational way. With this under our belt, I feel it is now time to expand the garden and use what we learned last year to establish a new pollinator garden in a more prominent location, to better serve the public. As a volunteer and leader of this project, I see it as an opportunity to implement something truly special and long lastings. A garden which not only benefits wildlife but also serves as a work of art to inspire people for years to come. Native plants like this coneflower from the pollinator garden attract scores of butterflies. Volunteers not only got a chance to work outside on a beautiful fall day but also learn in the process about each plant. 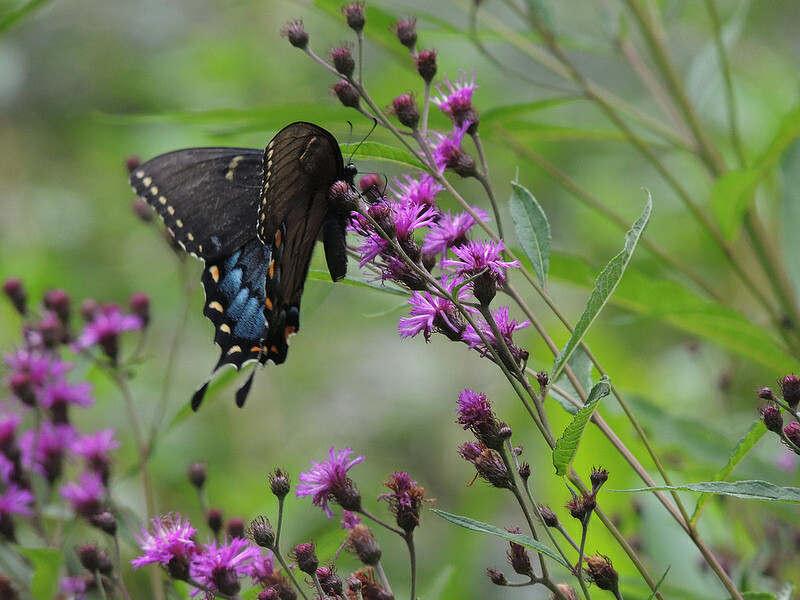 Native mints in the pollinator garden are loved by insects and people for their aromatic leaves. A garden in this area would be central and complimenting to the parks pre-existing infrastructure. It will be easily accessible from many directions and use an iconic boulder (which kids adore) at its center, as a key design feature. As in our first garden, there will be a great enthuses plant diversity, but this time with a stronger focus on aesthetics and color. This will be first ever, all-native color spectrum garden! The color spectrum garden will be broken down in color curated mini gardens such as the White Garden, Yellow Garden and Purple Garden, with subsections of blue, orange, red, pink and black. This has never been done before with solely native plants from the Eastern United States. With a focus on art, this garden will inspire the public to become more interested in the science behind beauty. Your donations will be the foundation for innovation and the legacy that this garden will leave. Create the first ever all-native color spectrum garden located in Fort Greene Park, Brooklyn! Aquire donations for initial plants, labor and materials. Begin installation of plants with volunteers in the fall of 2017. Begin fundraising for infrastructure which will include fencing, benches, bee houses, ect. Plan springs tours and educational programs for spring, summer and fall of 2018. 1. Aquire donations for infrastructure. 2. Implement parts of infrastructure starting with fences in the spring of 2018. 3. Install gazebo and enclosed pond by end of 2018. Infrastructure in the garden will commemorate colonial style gardens once found in Brooklyn around the time of the American Revolution, a major theme in Fort Greene Park. One of the world's most famous gardens, the White Garden at Sissinghurst Castle in England, is a perfect example of how a monotone landscape feature can be truly powerful. Sissinghurst's garden is visited by thousands of people each year, and is iconic for its clever use of only white blooming plants. While not technically a color, White can still play an important role in a color spectrum. 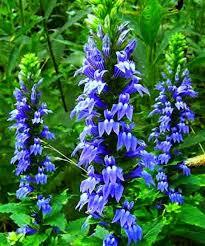 It acts a cooling agent when seen next to reds, oranges and yellows, and compliments the blues and purples. Its provides a divine element, almost spiritual when used in certain ways. In a garden, it inspires reflections and calmness. White is also one of the most prominent flower tones in nature, so this section will larger than the others. Note: The image on the right is of the White Garden at Sissinghurst Castle, and all of the plants in this image are actually native to the Eastern United States! Pink is one color we see each day, in fashion, art and of course in nature, and is often associated with femininity. It is noteworthy that historically pink has actually been deployed as a color of kingship and masculinity. All the while in nature, this wonderful color has no gender role, but acts always as the combination of severals colors such as red, white, and purple. Pink warms up your heart and adds a level playfulness to life, never taking itself to seriously because it doesn't have to. 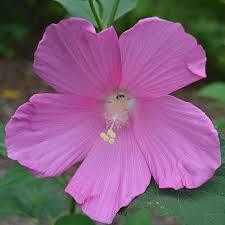 Its beautiful and dynamic, and plays an important role in flower world! Blue like green is a quintessence of earthly color. 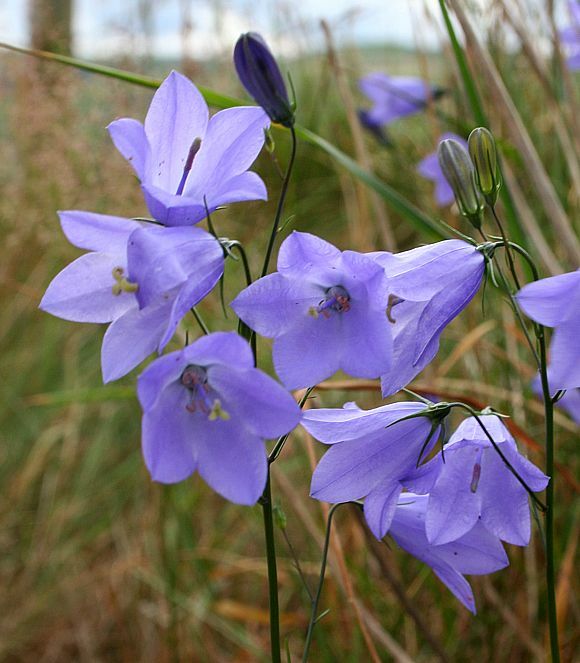 Found in the sky and the ocean, on birds and in eyes, blue appears in flowers and is always stunning. Blue also adds great contrast to warm colors like yellow, which this section of the garden will be adjacent to. That being said true blues in the plant community are hard to find and are often a variation of cooler purples. This garden will attempt to portray a bluer scene, not one of mood but aesthetic, using plants which together provide a wonderful sense of the color. Blue is also a favorite color of bees. They love it! A group of people standing next to Prairie Dock, a featured plant of the Yellow Garden. Yellow projects happiness. It's actually scientifically proven to effects peoples moods for the better. It is why The Simpsons were made to be Yellow. Yellow is a prominent color in the flower world and so this section will be larger than its neighbor blue. Yellow is adored by pollinators and is home to a diverse range of species, like Rudbeckia (black eyed Susan, coneflowers) Helianthus (sunflowers) and Solidago's (goldenrods). In this section of the garden, you will have lots of action from palliators and some interesting variations in height. Many of the sunflowers and coneflowers will grow to be more than 7 feet tall in maturity! This will certainly be visible from across the park, drawing you and pollinators in for a closer look. Black like white is not truly a color and for the purpose of this project, will play an important role in providing contrast. In the plant world black is used to describe an interesting genre of plants with darker features, like deep red and purple leaves. These plants create depth and intrigue, and will be located on the opposite end of the triangle as white, next to the Yellow Garden and Red Garden. Many of the plants used here are unique in nature, and cultivated because of their rare mutation that keeps their leaves from turning green. This will be the only 'forested' section of Color Spectrum garden, with primary woody shrubs and trees. For a long time Red has been associated with the rose, especially one given by a lover. It's the intensity of color that is emblematic of the power of human emotions. In the Red Garden, we will use a range of native plants which boast the richest reds you have ever seen! They will scream out when contrasted between the Black and the Purple Garden. 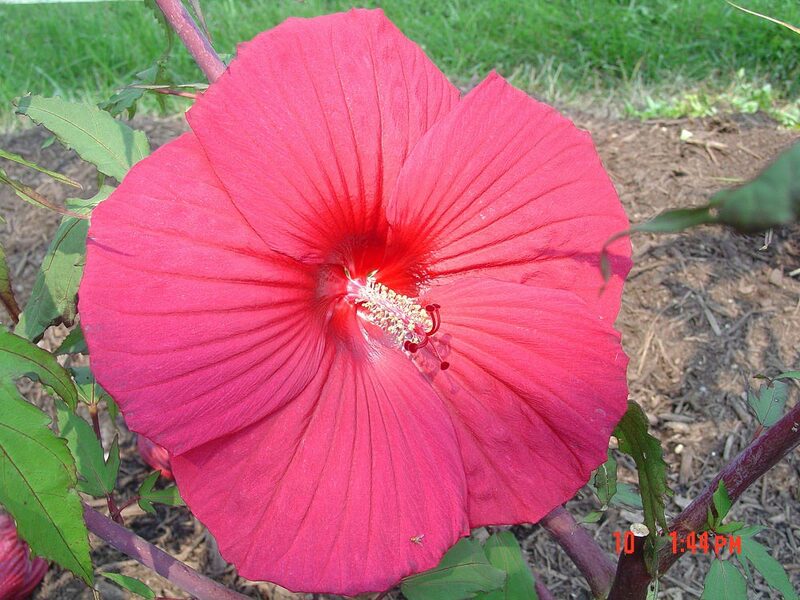 Red is also a very interesting color in nature and in animal biology. For example, bees can't see red, so unfortunately this garden is not for them. The animal that chooses red colored plants, and which all these flowers evolved to attract is the humming bird! And who knows, with this garden Fort Greene Park may start attracting them soon. Purple is one of the three largest color genre's including white and yellow, and will not only be mesmerizing in terms of flower combinations, compositions and height, but also for its attractiveness to pollinators. It is fair to say each color garden attracts beneficial insects but purple is by far the most magnetic towards butterflies. They go crazy for it! We predict the butterfly population will explode with this garden. When used in mass, purple just pulls you in. On either side of this garden will be the red and orange gardens which will provide contrast and balance. If you've read through this all, you may be all colored out, but lets not forget our final colored garden is orange. Like blue, orange in the flower world is often a combination of several hues, bordering yellow and red. There are true oranges though, like our native ButterflyWeed, which is important to Monarch butterfly's. 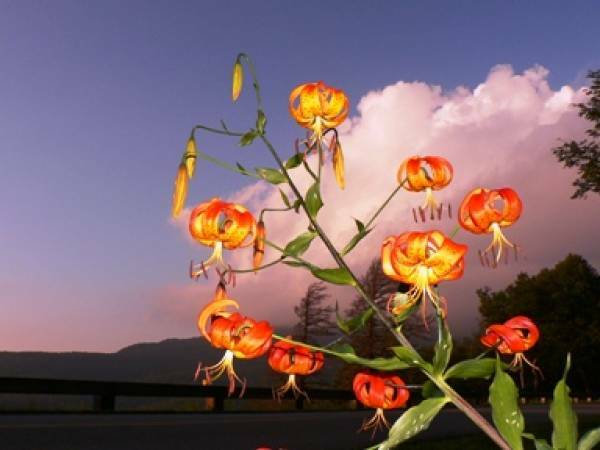 Other great native orange flowering plants include the Lilies, such as Canadian and Turk's Cap lily which are very hard to find in the wild because deer eat them and there are simply too many deer! It will be a special treat for the public to experience them in Fort Greene Park, as an oasis void of large herbivores, at least for the moment. 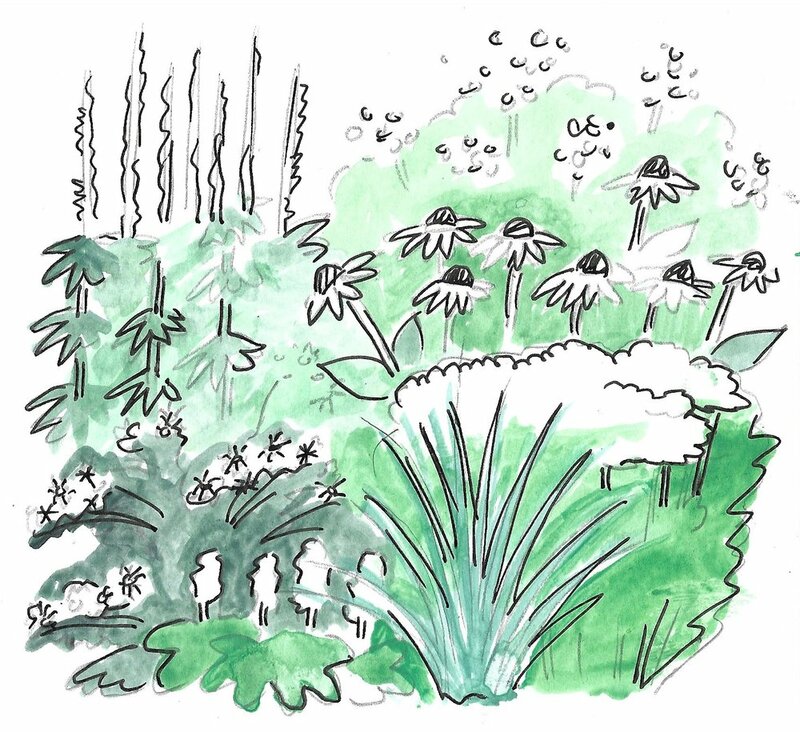 This September, our goal is to raise fifteen thousand dollars in fully tax deductible donations to the Fort Greene Park Conservancy in order to begin the project this fall and get the plants in the ground. Please let us know if you are interested in contributing to this public work, or if you know people who may have interest. We would love to begin a dialog with you.